In the community, geriatrics is the discipline of medicine specializing in care of the aged, defined as 65 years and older. In prison, the age at which an inmate is deemed “geriatric” varies from state to state (Lemieux, Dyeson, & Castiglione, 2002). In some states, inmates as young as 50 are defined as geriatric; in other states, inmates are not considered geriatric until they reach age 55 or 60 (Anno et al., 2004; Lemieux et al., 2002). Despite these differing definitions, there is consensus that inmates undergo a process of accelerated aging compared to their age-matched counterparts outside of prison (Aday, 2003). Outside of prison, people often encounter new physical, psychological, and social challenges as they age. In prison, an environment designed for younger inhabitants, aging introduces additional challenges in safety, functional ability, and health. As older ex-prisoners reenter their communities, they may face additional challenges such as being frail in an unsafe neighborhood, having multiple medical conditions with limited access to medical care, and leaving the familiarity of the place they have lived in for decades. 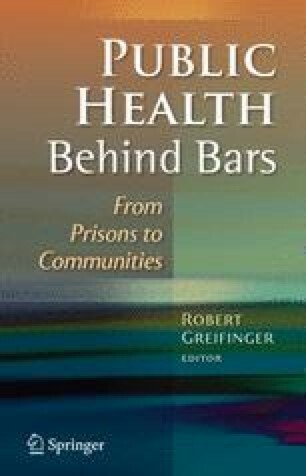 In this chapter, we describe some of the special challenges related to the aging of the population both inside prison and on reentry into the community. Despite the public health and economic implications of the surging geriatric prison population, little research has been conducted in these areas, particularly regarding reentry. http://www.ahrq.gov/clinic/uspstfix.htm. U.S. Preventive Services Task Force (USPSTF), Agency for Healthcare Research and Quality. Retrieved August 15, 2006.
http://www.census.gov/hhes/www/disability/sipp/disab9495/ds94t1h.html. United States Census Bureau Website. Retrieved October 20, 2005.
http://www.dc.state.fl.us/pub/annual/0405/index.html. (2005). Florida Department of Corrections 2004–2005 Annual Report. Retrieved August 10, 2006.
http://www.gwu.edu/ccommit/law.htm. George Washington Law School Website. Retrieved April 1, 2004.
http://www.ojp.usdoj.gov/bjs/pub/pdf/reentry.pdf (2003). Reentry Trends in the United States. Retrieved August 1, 2006.